April 6, 2018 10:30 A.M.
Steven Del Duca, Minister of Economic Development and Growth, made the announcement today at the company's facility in Toronto. Ontario is providing a grant of up to $1,330,860 million through the Jobs and Prosperity Fund towards an overall project value of $22.8 million. The project is expected to be completed by January 2024. 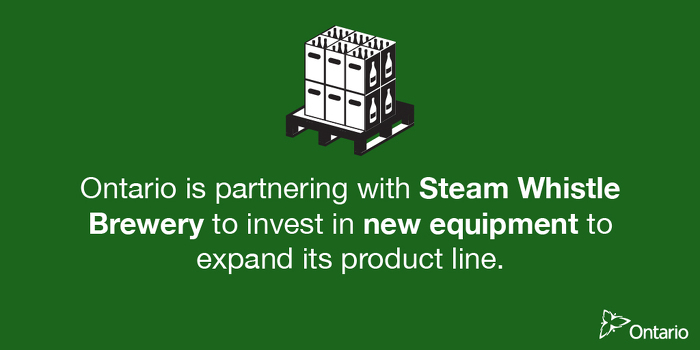 Steam Whistle Brewery was founded in 2000 and uses products and services from more than 100 businesses in the supply chain, 80 per cent of which are located in Southwestern Ontario. The Jobs and Prosperity Fund helps secure private sector investment in Ontario, allowing the government to partner with businesses that are creating jobs and enhancing productivity, innovation and exports. Every dollar invested through the fund leverages an average of $9 in private sector investments. Since January 2013, Ontario has announced 35 projects that are now administered under JPF, with government commitments totaling approximately $830 million, and leveraging over $10.9 billion in total investment. This is helping to create and retain approximately 46,000 jobs.